Over the years, dental fillings can become worn-down and even fall out if not properly cared for. However, even if the best care, they still have a limited lifespan. Whether you’re replacing your fillings altogether or need your tooth restored for the first time, everyone should know about the possibilities tooth-colored fillings can provide. Instead of settling for grey reflections coming off of silver fillings, consider the beauty that composite resin can bring to the table. 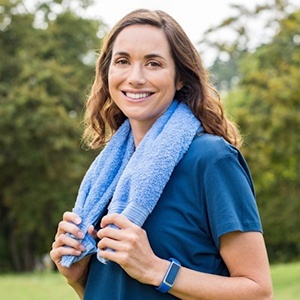 You can get started by calling our office and scheduling an appointment with either Dr. Rose Johnson or Dr. Wayne Barker today! Instead of relying on metal alloys like tin, copper, mercury, nickel or gold, tooth-colored fillings use a completely different blend of materials altogether known as composite resin. This blend of plastic and glass is designed to not only restore teeth damaged by decay or trauma, but seamlessly blend in with your remaining healthy tooth. Once placed, it will be almost impossible for others to notice you have fillings. This is quite a far cry from the silver sheen that amalgam fillings give off. Along with having a more appealing aesthetic overall, tooth-colored fillings are less likely to expand and contract over time. Amalgam fillings are made from metal, which means they would regularly expand when exposed to hot and cold stimuli, then contract back to its original shape. This would only break apart the tooth over time, acting as a wedge. 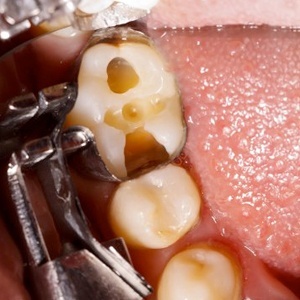 Since composite resin does not respond to stimuli in this way, it doesn’t cause this issue in teeth. Furthermore, composite resin is much easier to mold inside of teeth once placed, reducing the need for removing additional tooth structure in the process. After examining your teeth and removing any present decay, one of our dentists will begin preparing your tooth for filling placement. This typically includes applying an etchant material, which allows the resin to better bond with your tooth. Next, the tooth-colored filling material is placed directly onto the tooth and molded to fill the cavity. Finally, once the filling is shaped, we’ll use a special curing light to harden the material instantly. Keep in mind that tooth-colored fillings are blended prior to placement so that they match the same shade as your current tooth. However, it’s important that you don’t damage your fillings by chewing on inedible objects (i.e. pen caps, pencils, packages, etc.) as this can easily damage the material. Much like natural enamel, damaged resin is more susceptible to staining, so always use the proper tools for the job. Additionally, daily at-home care is necessary for making tooth-colored fillings last. 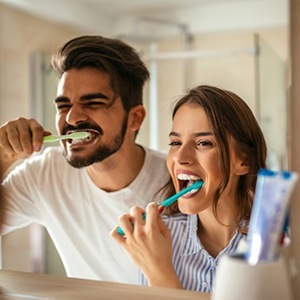 Brushing twice a day with a fluoridated toothpaste, flossing daily and visiting our office for checkups and cleanings every six months will ensure your restoration lasts for many years.